Material master, a critical piece of master data, is often created by multiple people in an organization in an ad-hoc manner. The manual process involves more than 25 different screens, consumes a significant amount of time, often suffers from poor coordination, and can introduce significant errors in data that can lead to failed orders or shipments. Create simplified material master creation forms online for a single material with workflow. With Winshuttle products, organizations can save time and money while reducing material master errors. 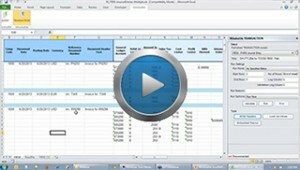 How is the material master data written to SAP? Are all the custom fields and validations that we have setup in SAP preserved? The material master data is written to SAP using Remote Function Call (RFCs) and Business Application Programming Interface (BAPIs) and all custom fields and the validation rules are completely preserved. My material master creation involves not just MM01 to create material, but also follow-up transactions to create information records and suppliers. How does Winshuttle handle that? Winshuttle enables users to link or chain multiple transactions with data from the same Excel file or form.